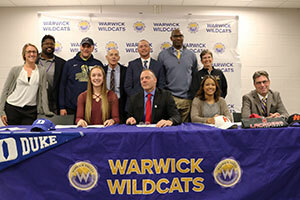 National Letters of Intent were signed on November 14, 2018 by two Warwick Valley Central School District student-athletes. They were joined by family, coaches and classmates to celebrate the occasion! L-R: Kaeli Thompson and her mother and sister pictured with Taina Gamory and her parents. Photo by Heidi Thonus. Pictured L-R (standing) – Coaches: Tori Pennings, Kirk Thomas, Dr. Frank Welling, Coach St. Lawrence, Coach Potter; HS Principal, Dr. Larry Washington and Athletic trainer Sue Abel. 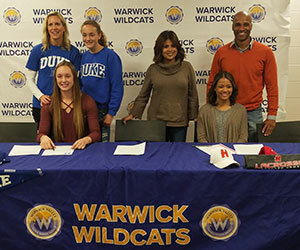 L-R (seated) – Kaeli Thompson (Duke University-Track), Athletic Director Gregory Sirico, Taina Gamory (Hartford University-Lacrosse) and Coach Denis O’Connor. National Letter of Intent to attend Duke University of Durham, North Carolina. Partial Athletic Scholarship. Recruited by Shawn Wilbourn Associate Head Coach to compete as a Track and Field Athlete (Both Indoor and Outdoor) for the Duke Blue Devils of the Atlantic Coast Conference (ACC). Duke competes against Clemson, Florida State, University of North Carolina, Kentucky to name a few. Kaeli chose Duke over Michigan, Oklahoma, University of Virginia and Stanford. She will join Jenna Crean (Orchard Park, NY) as only NYS recruits. Heather and Greg Thompson of Warwick, New York, Superstar Sophomore Sister Kristin Thompson (NYSPHSAA State Qualifier for Cross Country 2018). Coached by Mike Potter, Kirk Thomas, Curtis Akacki, Tori Pennings, Gene Burns and Tim St. Lawrence. National Letter of Intent to attend The University of Hartford, Connecticut. Partial athletic scholarship. Recruited by Megan Decker Head Coach at University of Hartford to compete as a Midfielder for the Division I Girls Lacrosse Team of the America East conference (AEC). Hartford Hawks compete against Stony Brook, Binghamton, University of Albany and UMBC to name a few. Taina chose Hartford over FDU, Mt. St. Mary’s and Montclair State. She will join her sister Gaby who is a sophomore soccer player for the Hawks. Mary and Tim Gamory 91’ of Warwick, New York, Sisters, Mayte (attending College of New Jersey – Accounting Major) and Gaby (Majoring in Biomedical Engineering at Hartford). Coached by Denis O’Connor.